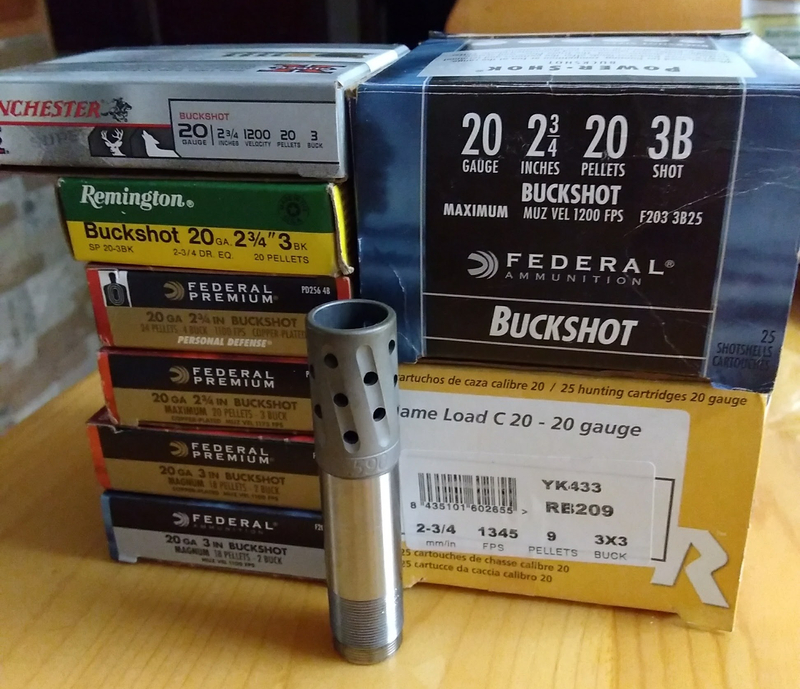 This post is the second in a series that is exploring 20 gauge buckshot and the poor patterns I have experienced so far. And what it will take to make an honest 50 yard 20 gauge buckshot gun. In the first post I cut open all the commercial 20ga buckshot loads I could find, 10 in total. I measured the payload and pellet weights, powder charge and buffer. That post can be found here. In this post we are going to look at choke constriction, what constriction might work best and what a number of chokes I have on hand actually measure. There is just so much more information out there on 12ga buckshot. It is exponentially more popular than the 20. So, lets look at recommended sweet spot constrictions for 12ga and see how that equates to the 20. In the Predator Masters forum, there may be the greatest buckshot pattern thread I have ever found. They seem to think that for smaller buckshot like #4, .050-.060 performs best. For 12ga that would be a choke around .679. That would put the 20ga around .565-.555. A lot tighter than what is generally thought ideal. A lot of people seem to like a 12ga choke around .690. Constriction .040. .575 in 20ga. If we look at the constriction as a percentage of the bore diameter in 12ga we get a constriction percentage of almost 7%. In 20ga that equates to .042 or .573. Still a little tighter than the choke manufacturers call for. A note I found interesting as I was measuring chokes being the Kicks Buck Kicker is .607, only .008 constriction. About improved modified. Kicks doesn’t publish that number anywhere. I had to buy it to measure it. They are claiming 20 or 22″ pattern at 40yds. We will be finding out if it will live up to it. My overarching goal, with the right choke and handloads is going to be 100% pattern in 15″ at 40yds. A lot of people say a more open choke will shoot buckshot better. Kicks is definitely in that camp. Jebs, upon calling to inquire about 20ga buckshot choke recommendations, suggested .585. Comp-N-Choke, which I do not have an example of but will be adding to the test recommends .580 on their website. Sumtoy customs told me through email, they have had .565 pattern well. A local choke maker, Ashland Gun Innovations said through email .570 worked well with Winchester #3buck. We are getting constriction recommendations from .030-.050. I am shooting an 870 20 and need to mic the bore to get a good baseline before I start testing. I don’t plan on shooting the larger buck through the .555 turkey chokes. But sure am considering some of the smaller #4buck. And also the TSS T shot when we get around to that. Following is the chart of chokes I have on hand.